For the first time in a while, there is the prospect of 25-50 mm of rainfall into parts of southern NSW desperate for some relief. Falls are expected to extend into South Australia and Victoria and this has encouraged a drop in lamb throughput levels this week from the elevated trend we have seen during May, in turn providing a boost to lamb prices. Table 1 highlights the sale yard price movements across the east coast, with gains between 2-6% noted for all categories. 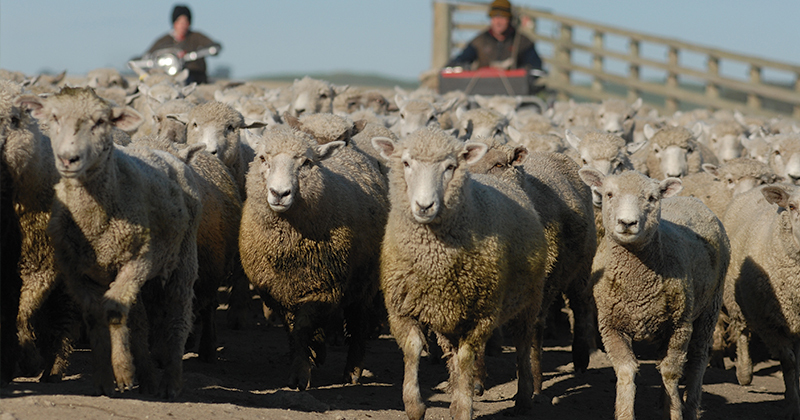 East coast Restocker Lambs are benefiting most from the wet forecast with a 6.1% lift to see it back above 600¢. The Eastern States Trade Lamb Indicator (ESTLI), not quite as robust a performance but still a respectable 2.7% lift to close at 636¢/kg cwt. Figure 1 outlines the Bureau of Meteorology’s forecast for the coming week in terms of rainfall and although a long way yet from satisfying the parched areas of NSW, it’s a welcome relief. Lighter falls of up to 10 mm are expected to extend to northern NSW but the bulk of the rain will centre upon Victoria and the southern regions of NSW and South Australia. The wetter outlook seems to have weighed on east coast lamb throughput this week which staged a 13% decline (Figure 2). This brings lamb throughput back in line with the seasonal average levels for this time of year and is 8% softer than for the same week last season. East coast lamb yardings are now back to more normal seasonal levels after spending much of May above the usual range. 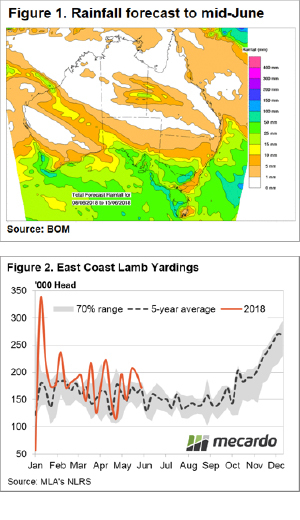 In contrast, east coast mutton throughput remains elevated, underpinned by persistently high NSW mutton yarding levels. Indeed, NSW mutton throughput currently sits 105% over the seasonal average for this time in the year with over 63,000 head changing hands this week at NSW sale yards. The rain due this week should continue to provide support to lamb and sheep prices in the short term. The prospect of supply beginning to tighten as we head further into winter should keep prices fairly robust into the coming few months.